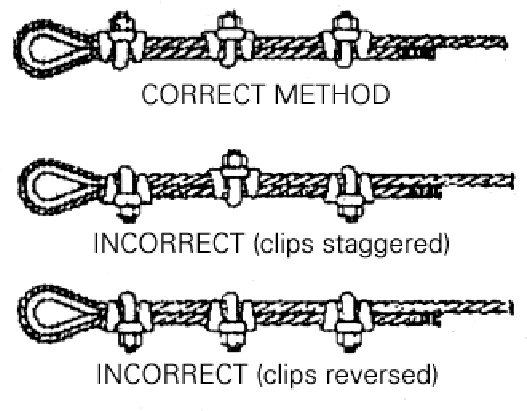 Figure 4.3: Correct and incorrect methods for using clips and thimbles on wire rope. The saddle of the clip rests against the ``live'' portion of the wire rope while the U-bolt rests on the short, ``dead'' portion of the wire rope. Using clips improperly severely weakens the connection, making it unsafe. Remember: never saddle a dead horse. When working with wire rope, it is extremely important that several guidelines are followed with regards to termination. Any time the wire rope needs to be attached to a hang point that would cause the cable to sharply bend, a device called a thimble must be used. Thimbles simply guide the cable into a natural curve shape and offer a degree of protection to the cable in the loop. To secure the end of the rope, wire rope U-clips are used. These clips provide an effective means for terminating cables, but must be used properly to be fully effective. Figure 4.3 shows correct and incorrect methods for applying these clips. Turn back the appropriate amount of cable from the end of the piece being worked on. This amount varies with the diameter of the wire rope, but is typically from 12 to 18 inches. Apply the first clip nearest the very end of the cable. Always leave a couple of inches of extra cable beyond the clip. Be sure to apply the clip properly -- the U-bolt goes around the dead end of the cable, while the saddle goes around the live end. Tighten the nuts on the U-clip evenly, and to the torque recommended by the clip manufacturers. If a thimble is being used, insert it into the loop, and then apply the second clip in the same fashion as the first, but only finger tighten the nuts. Apply additional clips evenly between the first two clips. Two clips are usually sufficient for wire rope under 1/2 inch, but three are often used for safety. Wire rope of diameter 3/4 inch or greater requires four or more clips. Tighten all clips to the recommended torque. Apply the load and re-tighten the clips. This re-tightening is important, as wire rope tends to shrink in diameter as load is applied. Another method for securing the ends of wire rope is through the use of swages, or nicopress sleeves. Small metal sleeves are pressed on to the wire rope with a special tool. These sleeves are permanent, but act much in the same way that clips do. When properly applied, swages can hold the full rated working load of the cable they are attached to.